It’s been an eventful year for you – debuting your website, Skinpickingsupport.com, becoming a board member of the new Canadian BFRB Support Network (CBSN), being the subject of the upcoming documentary film, Scars of Shame, leading workshops and speaking at the Trichotillomania Learning Center (TLC) national conference, not to mention events in your personal life, such as getting engaged. All good things, so congratulations! Would you like to tell us about some of these experiences? Yes, and thank you! Actually, my website was created by my fiancé, Jason, which launched at the end of November, 2012. It got off to a slow start but quickly boomed with visits once I wrote the article “12 Dermatillomania Myths Dispelled”, which I am extremely proud of! Speaking of fiancé, I was proposed to on April 10th of this year – five days prior to our 3 year anniversary. It was only a little over a week later that I traveled to New Jersey to attend TLC’s annual conference, so a lot of life-altering events were taking place at once! I went out on a whim last November when I decided to put my skills and education to use by applying to be a presenter at the conference, which required workshop proposals- and I was thrilled to be accepted! After that, I received an e-mail asking if I would be interested in giving a 5 minute speech about my “Success Story.” I was humbled… especially given that I am not the typical success story, being a current skin picker and all. Everything turned out at the conference. I feel like I exceeded my own expectations with presenting, social interactions, and with my speech. I wouldn’t say I generally lack confidence (maybe some) but the pride I felt about how well everything came together solidified that being active in the BFRB community is what I thrive at and is what I am meant to do. I’m a huge believer in selfless service, that when you do for others, it gets you out of the cyclical thinking of being depressed about yourself and your situation. You do a lot of service work, especially with your website (www.skinpickingsupport.com) and serving on the board of CBSN. What has it meant for you to be able to transform a terrible experience with severe skin picking into an opportunity to serve others? It really proved to me that it is always possibly to rise above! We set limitations on ourselves, ingrained by society’s scrutiny which makes it difficult to stand for what we believe in. We fear what people will say when we expose our darkest secrets, the very ones that hold us back. We have a perception that everyone will have the cruel intentions we see on a societal level, but on an individual level people are usually receptive and acknowledging of our suffering, even if they do not grasp the disorder itself. Change cannot occur until we make it occur – and it will, but we need patience and allies. Before I began my awareness journey I was just a suicidal mess who slipped through the cracks of a broken mental health system in a small patch of Canada that is often ignored. I believe with the above realizations I was able to break through that cyclic depression, and that continuing down this path has kept my depression in check. Was helping others your idea in the beginning, back when you wrote your first blog and your memoir, Forever Marked? Or did you write your story more as a creative endeavor, or as therapy, something you felt you needed to get out? It was for me, only me, and there was no way anyone else was going to see this! I had two blogs online already – one for my friends, another for people in the mental health community, and then this even more secret one because none of the strangers who read my mental health blog were able to relate to my skin picking struggles. It was my personal therapy because racing thoughts related to this disorder just bogged down my mind. Not being able to stop picking my skin, not understanding what was going on, not knowing who to turn to- it was overwhelming and I felt like a “freak”. Not only that but there weren’t (and still aren’t) professionals who deal with this disorder specifically in my area. The psychotherapy I received in light of my dermatillomania was with “Dr. A”, who is mentioned in the book. She half-heartedly attempted CBT with me straight from the trichotillomania section of The OCD Workbook but twice told me I wasn’t trying hard enough and that she couldn’t do anything else for me. I still don’t understand it to this day. I did all the homework she gave me from the book and gave it all I had; the second time she told me I shouldn’t come back because I wasn’t doing it right… I had to give up that attempt at recovery. Aside from her condescending and belligerent abuse of authority, I have also had brief encounters with a mental health nurse and with a duty doctor who mocked me. I only had my blog to turn to. I imagine you hear from a lot of young readers of Forever Marked. What’s the most common thing they tell you? I’m guessing they may feel they know you so well from the book that they even open themselves up to tell you their stories. What is that like for you? I hear from people of all walks of life, with varying ages, who have this disorder. Not only that, but I have heard from people without this disorder who opened up their dark secrets to me because they found ways to relate to me through the book. This has been the greatest gift in doing all of this! I have had the honor of learning about the struggles of acquaintances, strangers, and people I have never met that I wouldn’t have known otherwise. They have placed that trust in me and it means SO much to be that well-respected/ trusted/ admired person that they found the strength through to be that open with. It’s a responsibility to not be taken lightly or taken advantage of. No matter how many times someone comes to me to tell me their story, regardless of whether or not they have read my book, I treasure it because I know the impact a secret has on someone’s life and how disclosing it can be equal to entrusting someone else with your life. To be that person on the receiving end really makes me feel like everything I do regarding awareness has a purpose. That’s really beautiful – what a gift you have given, and are receiving. What would you say now to a person suffering from skin picking, someone who is completely in a state of despair about their situation, as you yourself had been in the past? Don’t give up. Reach out. Even if it’s only online at the beginning, stay connected. Focus on what it is about the picking specifically that bothers you- is it your appearance, the inability to control your urges, your lack of understand about the condition? Look deeper into the reasons why it bothers you because those reasons can be addressed; most of us face additional mental health issues by the time our condition is recognized by professionals but they can help you face the depression/ despair of having the disorder, the symptoms of anxiety, poor body- image/ self- esteem, while offering methods used for treating OCD. In the end, working through these additional issues will reduce your skin picking. If you live in an area like I do, you may not have access to specific treatments for dermatillomania, but you can still gain control of your life back! You may feel that having dermatillomania is your life, your identity, but there is far more to you than the all-encompassing feeling this disorder causes sufferers to have. It’s a feeling based on being worn-down but feelings can change for the better! Don’t allow yourself to give up until you’ve tried every therapist, medication with medically cleared dosages, types of therapy, combination of therapy methods, fiddle toys, being active through TLC and CBSN, all at different stages in your life (But NEVER anything from a website that claims to have a “revolutionary or secret cure” that you must buy). Something you may have tried 5 years ago may work now; we learn something new about ourselves from every method tested, even if it hasn’t given us desired results. The truth is, you follow this theory and you’ll never be able to say “I’ve tried EVERYTHING- I can now give up”. There’s hope everywhere, always. I think I remember from one of your blog posts that you’ve been having debilitating back pain. Is that a chronic problem related to picking? How are you feeling nowadays? I have had back pain since I was young, which then traveled to my knees at about age 16/ 17, then my hips at 19/ 20. I was a ticking time bomb with my back and with having been in Physiotherapy during two separate periods (a decade apart) in my life, it still wasn’t enough to prevent my back from giving up on me. For the past five years, I’d say, I haven’t been able to stand up for more than five minutes at a time in one place without extreme amounts of pain. It’s even evident throughout the documentary “Scars of Shame”, which was filmed between 2010 and the beginning of 2012. In October of 2012, I attended a funeral and had to sit/ stand many times throughout the service (wearing heels in a wooden pew), which finally did me in. I had expected, as per norm, that my sore back would just take a few days to recover so I could go back to “my managing self”… but it didn’t. My recovery process has been much slower than I anticipated. I’ve been seeing a chiropractor regularly for the past eight months and visited a massage therapist at a local massage school for roughly two months. Unable to work or claim benefits, things have been unsettling financially, which has affected my self-esteem because I can’t go out and work at the moment. My knees have felt great for the first time in a decade and my hips are seemingly fixed, but I have this chronic issue with my left Sacro-Iliac joint and the muscles in my back are very weak. I have to wait at least another 4 months before getting into the pain clinic, so here’s to hoping they will assist me with Physiotherapy! Looking at the timeline, it’s very possible that my original back problems stemmed from the hours of sitting on my bathroom counter, picking my skin. I do have a protruding C2 vertabrae which I am guessing is from those same hours of lowering my head while fixating on my skin for hours on end. How did Scars of Shame come about and what was the process like for you, the subject of the documentary? What are your hopes for the film? This is a unique tale! The director, Lisa Heyden, had donated a prop medical table to a local photographer I was modeling with back in 2008. I had wanted to get a few shots taken, maybe on a chair or the floor, for my book cover but when I came in and saw the table… I HAD to use it! It was too perfect and it was so coincidental that something that large and resourceful was there the very day I had come in. Months later, Lisa asked the photographer if the table had been used and he told her my story. She was interested in it for a documentary and wanted to meet with me-eventually it came together! I never expected to go to San Francisco for the filming process, or to a TLC conference, and had it not been for that experience, I don’t know if (or when) I would’ve conjured the courage to go to a conference. My hope for Scars of Shame is that it will be an informative film- a tool for sufferers, parents, partners, professionals, and even professors in the medical field to use as the #1 media resource about this condition worldwide. I am pleased that my story was told accurately without embellishing it to make it more “catchy” and can say with confidence that my hopes have come true, given the right amount of promoting done behind-the-scenes. I am now only hoping that the hours of interviews with the top professionals in the BFRB world will be included in the “Special Features” section to give all sufferers promising information from the best of the best. What’s next on your plate? Any new projects brewing that you can tell us about? Well, my priority is getting my back better! During this process I will continue to help the only non-profit organization in Canada dedicated to BFRB awareness, CBSN, spread its name and use my knowledge in the field to assist with its formal launch. Once CBSN is fully established, I want to shift my focus from self-promoting to using 85% of that time on CBSN. So to all sufferers of Dermatillomania and Trichotillomania who are reading this, please “like” CBSN on Facebook. Although we are Canadian-based, we will be the 2nd organization in the world dedicated to BFRB’s which means that we will be another venue, alongside TLC, who has the goal of worldwide awareness. I am on the Board of Directors currently. Who knows, maybe the future will have more in store for me through CBSN! Let me know if there was a question you were hoping I’d ask! Feel free to answer it. First of all, thank YOU Annette for taking an interest in my story! You have been so supportive of my endeavors. I hope my answers can help people with any BFRB come to accept that these conditions do not have to define your life. What is more harmful than a BFRB is how our perception about it makes us feel about ourselves and how keeping it a secret from the ones we love can consume us, hurling us down the path of isolation and destructive thought processes. Well said. Thank you, Angela, for taking the time to share your thoughtful, inspiring answers with us. Everyone, if you haven’t yet, be sure to go to Angela’s website www.skinpickingsupport.com, check out the resources there and sign up for her blog updates by email. 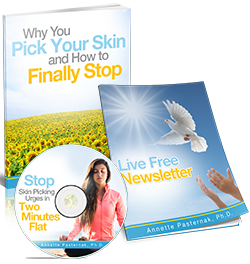 If you’re new to this site, please check out my homepage Stop Skin Picking Coach, and be sure to get my free Skin Picking Freedom Kit. 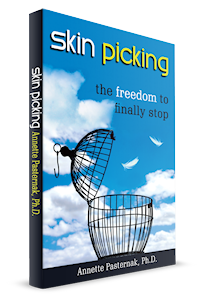 Pingback: Resource Review: Annette Pasternak's "Skin Picking: The Freedom to Finally Stop"